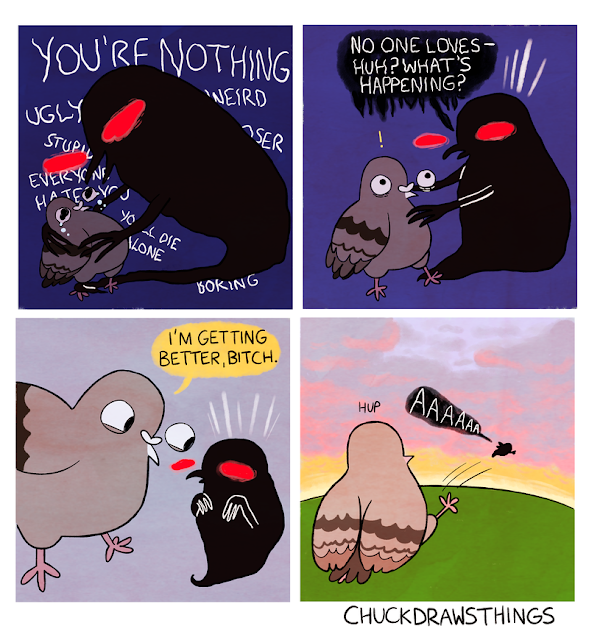 YOUR CHICKEN ENEMY: Focus For Funding: BIRD BRAIN by Chuck Mullin -- "a comic about mental health ... staring pigeons!" Focus For Funding: BIRD BRAIN by Chuck Mullin -- "a comic about mental health ... staring pigeons!" Anxiety is a wild ride. There’s a slew of complex emotions and experiences that accompany mental illness; nerves, fear, tentative happiness, the never-ending quest to convince yourself that you deserve to be content, the arduousness of forming human connections, and so on. In ‘Bird Brain’, I’ve illustrated comics showing what it’s like living with the unfaltering rollercoaster that is mental illness...using pigeons. In particular, anxiety is explored through three themes - negativity, relationships, and positivity. There seems to be a general assumption in society that anxiety and depression just involve sitting in bed crying. There is an element of truth to that, of course, but it’s much more nuanced. Sometimes, I’m walking around and crying! In the six or seven years since my anxiety started manifesting, I’ve had my fair share of negative experiences. Panic attacks in supermarkets, debilitating existential dread, constant scrutiny of every word that leaves my mouth, you name it. The first section of Bird Brain showcases all the forms that self-hatred can display itself in, and hopefully drive home that what may seem minuscule to most can have catastrophic implications for someone with anxiety. As you might guess, the above aspects of mental illness make it exceedingly difficult to establish meaningful and strong relationships with others, both romantic and platonic. The second section, ‘Relationships’, is composed of comics inspired by real conversations and anecdotes in my attempts to explain mental illness to those around me, and how anxiety has affected the connections I share with those I love. Although I feel that my mental health has improved drastically over the years (partly due to medication, a subject that is broached in several comics) there’s still a long way to go. However, I believe that anxiety doesn’t have to doom you to misery for the rest of your existence - there are infinitely more good times than bad, no matter how far-off the former may seem sometimes. The final section, ‘Positivity’, concludes the book with comics that look on the bright side, expressing my core belief that life is still worth living despite what you may go through. Overall, in Bird Brain I’ve attempted to display the complexities of living with anxiety, in ways that hopefully make you think about the intricacies of mental illness whilst also having a bit of a laugh. If it also helps you have a bit more sympathy and love for pigeons, as well, then my life’s work is complete.